South Sound Business Magazine Staff toured and experienced Yelm today! with Jeff Burlingame, Editor, 2nd from left. Last July, Premier Media Editor Jeff Burlingame sent a request to readers that if they would like to host a tour for him and some of his staff of area towns, they would like to come learn about the variety our region possesses to highlight in future editions. I immediately volunteered Yelm and that I would be willing to host. Knowing the expertise of the team of Experience Olympia and Beyond, I invited them to join me in this endeavor. So this morning, 6 staff from Premier Media, 3 staff from Experience Olympia and Beyond, and I toured Yelm for 2.5 hours with the intent to highlight the UFO Fest, Jazz Fest, and Yelm’s Community Center, coming Splash Park and the SPSCC collaboration with Yelm Schools. First stop was The Triad Theater, where Cameron Jayne had an outstanding presentation on her vision and the role of community theater in Yelm, plus her idea for a UFO Fest which will be in Yelm again this summer for the 3rd year. With the tour van passing by the Prairie Hotel, Yelm Skate Park, Yelm-Tenino Trail, the old city hall, the historical water tower highlighting the coming light extravaganza feature, the next stop was the Community Center. Mayor Foster, City Administrator Grayum and Public Works Director Chad Bedlington presented Yelm’s plans to update Yelm City Park with new play equipment, the proposed splash park, and a coming Mermaid Festival. Kelly Green, Public Relations & Events Manager for SPSCC, gave an excellent presentation on the collaboration with Yelm Community Schools and the City of Yelm on SPSCC offering classes in Yelm. The tour continued past the new city hall building, and the Yelm Prairie History Museum and ended at the last stop, Pizzeria LaGitana, where I hosted a lunch. Owners Marian Licxandru and Alin Stanciu shared their vision of their investments in popular restaurants in Yelm and Olympia during our wonderful meal. Marian also enunciated his vision for a Jazz Fest that he created here 2 years ago, and will be expanded this August to a two day event. The next stop was Tenino, followed by the last stop at Yelm’s Uptown Lounge to sample their popular fare. The group left uplifted in knowing more about this area than when they came. I thank Editor Burlingame for bringing his enthusiastic team to our area and look forward to how they convey to their readers what they learned here. I also sincerely thank Shauna Stewart, Moira Davin, driver Joshua and the entire Experience Olympia and Beyond team for their fine support. Council does not follow Yelm’s Municipal Code on Mayor Pro-Tem post! Correction published January 9, 2019: I incorrectly reported the Yelm City Council did not follow the Yelm Municipal Code (YMC). The council did follow the YMC by having a biennial appointment January 9, 2018. However, in a 4-3 split of the council between nominees Joe DePinto and Tracey Wood, Councilor Wood was appointed to an additional 2 year term. With Wood serving out the term vacated when JW Foster became mayor in August 2016, Wood had already been pro-tem for over 1 1/3 years. The 4-3 split vote for Wood to serve yet another term was exemplified in a 2018 study session where a councilor raised the issue that mayor pro-tem appointments should be rotated among the council and should not be a “popularity contest” appointment. The council agreed and discussed looking to rotate the position, perhaps as early as Jan. 2019. Nothing else followed from the study session for 2019. With Wood having been mayor pro-tem for 3.3 years at the end of this year, Yelm will assuredly see a newly appointed councilor for this post in January 2020. The Yelm Council is one year overdue in appointing a new mayor pro tempore according to Yelm law! Editor’s note: Yelm Mayor Pro tempore Tracy Wood was appointed January 12, 2016. His length of service was questioned by a council member at a study session in mid-2018, with the council agreeing to rotate this appointment at the end of the 2018. The council ended their 2018 business December 11, 2018, with no mention of a new pro-tem. The council agenda of January 8, 2019, mentions nothing of a pro-tem replacement. The city council should appoint a new mayor pro-tem on January 8 to serve for one year to the end of this biennium, as required by city code, then a new pro-tem appointment in January 2020, to serve the full 2 year term. Click here for the Yelm City Council Agenda of January 8. 2019. While the mayor pro-tem appointment may be yet another oversight, I have seen many items mentioned at council study sessions set for future meetings that were also dropped, unintentional or not. However, Yelm Municipal Code (YMC) requirements should be placed on city officials’ annual calendars to be followed. The YMC states, “A mayor pro tempore shall be appointed from among their membership by a majority of the city council members at the first meeting of the newly elected council at the beginning of each biennium, commencing January 1, 2002.” The Yelm Council is one year overdue in appointing a new mayor pro tempore, in addition to missing scheduling this as an agenda item in December and now the first meeting in 2019. Read more from the YMC. 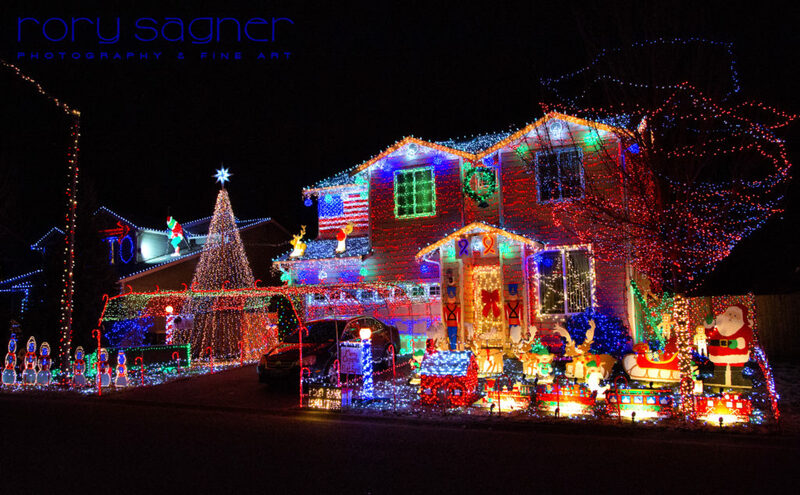 Merry Christmas to you and yours – From the Yelm Community Blogger! Yelm in the Christmas Spirit! Credit: Rory Sagner Photography & Fine Art, © 2018. The Yelm Community Blog has published an annual Christmas message since 2006. This except reminds us that the true spirit of Christmas lies in each of our hearts. Copyright © 1987 Fisher Broadcasting, Inc.
Worth hearing and seeing, from 2012. Click here for this moving song. NORAD to track Santa despite partial government shutdown! Click here for the Official NORAD Santa Tracker. “North American Aerospace Defense Command (NORAD) tweeted on Friday [Dec. 21] that it is prepared to track Santa’s flight across the globe as it has done for more than six decades. “Military personnel who conduct NORAD Tracks Santa are supported by approximately 1,500 volunteers who make the program possible each and every year,” the tweet read. “First lady Melania Trump, who arrived at the Mar-a-Lago resort in Palm Beach, Florida, on Friday, said she would still participate in the annual tradition of calling in to NORAD on Christmas Eve,” quoting Kalhan Rosenblatt and The Associated Press. Microsoft donates $3+ million modernization gift to Yelm region’s Goodwill! “‘This will allow us to run our organization more efficiently and more productively,’ said Lori Forte Harnick, president and CEO of Goodwill of the Olympics and Rainier Region, of the donation,” by South Sound Business. “Ninety-five salmon habitat restoration projects in 30 counties around the state will receive a total of nearly $18 million in grants, Washington’s Salmon Recovery Funding Board announced this week. “See the full list of projects and counties here,” quoting South Sound Business. “Supporting Southern Resident orca recovery efforts is one of the top priorities of Gov. Inslee’s 2019–21 budgets. His operating, capital and transportation budgets for the next biennium include a combined $1.1 billion in investments that will help ensure a thriving and resilient orca population,” quoting Office of Gov. Inslee. “The Yelm Banquet” – Come meet your neighbors this Saturday! Congratulations and appreciation go to this event’s initiator Matthew McLellan and his team who created the first-ever Yelm Banquet happening this Sunday, Dec. 16, 5 p.m., at the Yelm Community Center. The citizens of Yelm are hosting a FREE community catered event at the local Yelm Community Center. Lets get together and celebrate our unique culture! Food will be provided by local businesses as well as community members (you) in a potluck fashion. Do you own a crockpot?! Plugins for warm food are limited. Keep an eye on the page to reserve your own crocks-spot. Our mission is to share the strength of our community with its members by plugging our selves and our crockpots into a neighborhood environment, free of self interest. Our vision is to create a space free of inhibitions and conflict where citizens of the nisqually valley gather to feast and dialogue. This will organically stimulate the cultivation of friendships, other community events, and the permeation of energies that make Yelm such a great place to live. Come experience small town camaraderie, culture, and unity. One year since being elected, still no Town Halls by Mayor Foster. And an interactive, public issues-oriented social media page of the mayor, not just photo ops! site of previous Town Halls. “Four town hall meetings with Tacoma City Council members have been scheduled for this fall, the city recently announced. At the meetings, residents can learn about the city’s proposed 2019-2020 biennial budget and share comments with council members,” quoting South Sound Business. Yelm has had none in 2018 and has none scheduled for 2019. The Yelm city council can schedule their own public Town Halls, seeing how Mr. Foster has held zero Town Halls since being elected mayor, even though he committed to them as interim mayor. * Town Hall public forums are a community investment, as we are all TEAM YELM! * Prior to 2016, the previous Town Hall here was in 2004 for a proposed NASCAR track. * Yelm’s first Town Hall in a dozen years was held Nov. 4, 2016. * Two issues for discussion then: allowing marijuana retailers and food trucks in Yelm. * A cross-section of the public attended and excellent comments were presented for both issues. * So successful, Mayor Foster announced that regular public meetings would be returning to Yelm. * The 2nd Town Hall/Community Meeting was conducted March 27, 2017, focused on Public Safety. * Yelm’s Community Center has served as a perfect venue for the community’s public forums. * And Mayor Foster should have an interactive social media platform to interact with his constituents, as his Facebook page is merely for photo ops as if a campaign was underway. Councilors Carmody and DePinto have had interactive Facebook pages with their constituents for years. Outside of political candidates Town Hall public forums, Yelm has not continued having these meetings, yet this is an excellent vehicle for Mayor Foster, councilors, and city staff to engage with the public on issues of mutual interest. The previous public meetings were specifically topic-driven and very successful. New food truck and marijuana regulations were enacted from ideas expressed by the public, in addition to a greater understanding about Public Safety issues exchanged at the 2nd forum. Whether citizens live within the city limits or in the greater Yelm area, we’re all TEAM YELM, as we shop here, pay taxes here, property owners fund our community schools, library and cemetery, and have a stake in our community. Town Hall public forums led by the mayor with councilors and staff present are an investment in the constituents they serve. Let’s bring back Town Hall public forums and engage in open and regular dialogue. After all, the sum of our parts is greater than the whole, which creates dynamic synergy for the future of our town. Click here to express your support for regular Town Hall public forums with the mayor, councilors and city staff. 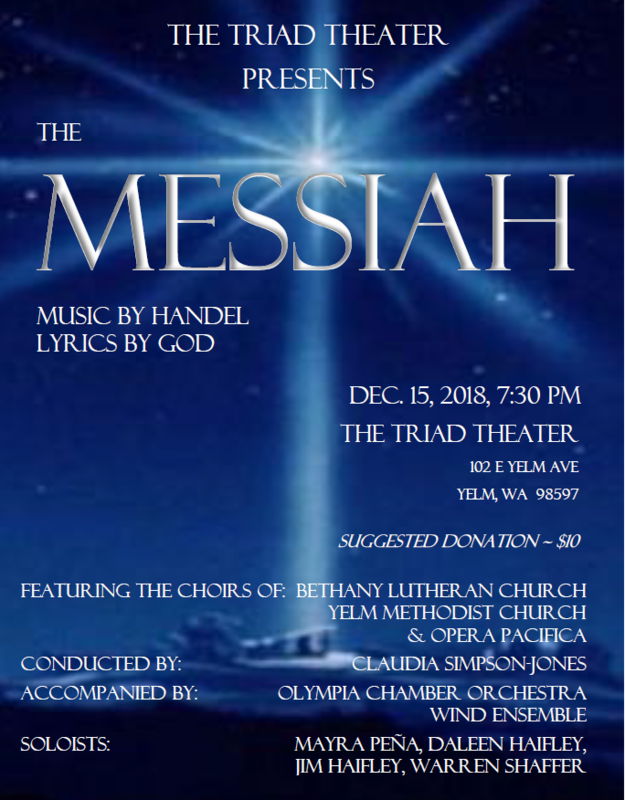 Handel’s Messiah performed in Yelm this Saturday! Saturday, Dec. 15th at 7:30pm, $10 – The Messiah – Conducted by Claudia Simpson-Jones. December 7 , 2018 is a day that will live in infamy for Trump! Trump’s DOJ accuses him of 2 felonies. Economic uncertainty follows. 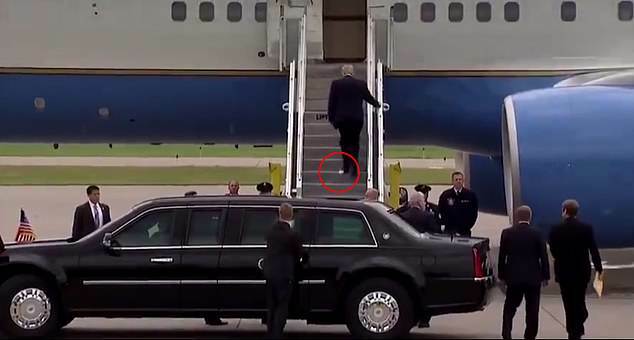 “President Trump boarded Air Force One with toilet paper stuck onto his left foot.” Oct. 4, 2018. Credit: UK’s Daily Mail. Editor’s note: President Trump clearly has more than toilet paper stuck to his shoe now that his own DOJ has accused him of committing two felonies according to documents released by the Southern District of New York (SDNY) on Friday, December 7, 2018. That was the 77th anniversary of the Pearl Harbor bombing, “a day which will live in infamy,” quoting President Franklin Roosevelt. Clearly, December 7th is a day that will live in infamy for the Presidency of Donald Trump, now more weakened on the world stage in being accused of 2 felonies. This is not good for America and as with Nixon in 1974, the uncertainly of what will happen with this country’s leadership in the future will spill over into economic uncertainty reflected in the markets, and eventually hit your household’s wallet. I am a Constitutionalist, so whatever you think of President Trump, I am for our laws being followed and if those are broken by our leaders, then they should be prosecuted as any other citizen. Stormy Daniels said this to President Trump May 5, 2018, on NBC’s Saturday Night Live (SNL), “a storm’s a comin'”!